I first gave a version of this talk on 6 November 2011, at the Tercentennial Community Service, held at the First Parish on the 300th anniversary of the founding of Needham. Subsequent presentations have incorporated information about the Congregation Church of Needham and St. Joseph’s Roman Catholic Parish. Looking back in 2011 at the covenant that formed the parish and town, and looking forward to a new covenant to guide our fourth century as a community, I was struck by the transition from singularity to diversity, and how managing that transition made us more unified – not less. Just over two centuries ago, in November 1811, the Reverend Stephen Palmer stood in the pulpit of the First Parish church and delivered his Sermon on the Termination of a Century since the Incorporation of The Town. The Century Sermon, reviewing the covenant that formed the parish, is generally regarded as the first account of Needham’s history. Like a good historian, Palmer took as his text Deuteronomy Ch32, v7: “Remember the days of old, consider the years of many generations: ask thy father, and he will shew thee; thy elders, and they will tell thee.” To know where you are going, he was saying, it helps to know where you have been. Needham in its first century was a very different town from the one we know, and not only because of physical growth or the changes in technology. The center was at Central Avenue and Nehoiden Street, near the crossing of two important coach roads. The town was very homogeneous – the residents had come from the same part of England; they belonged to the same church; they shared similar values, occupations, and economic resources. The Old Center (Central Avenue at Nehoiden Street) circa 1811, showing the First Parish Meeting House, the muster field, and the Brick Schoolhouse. Painting by Timothy Newell Smith, c. 1860. We value diversity – the multiplicity of opinion, experience, and identity. Diversity strengthens us. It fosters our growth and multiplies our resources. However, in 18th century Needham, the greatest strength was conformity. It was important to fit in. These were not people of independent means. Membership in the community was their only form of insurance in the face of loss or failure; their family, their neighbors, their parish would make sure they were cared for. Nor were they bombarded as we are with a constant flow of new and conflicting information; their authority was the Bible, which did not change. Nonconformity was dangerous and divisive, and nonconformists were ostracized. How we got from conformity to diversity is the story of Needham’s 300 years. There are two main ways of achieving diversity in a community. The first is by shattering, like a glass bowl dropped from a height. A catastrophic dissolution, in which all the pieces have spiky shapes and rough edges, and can no longer be joined together with any degree of security. The second is branching, like a tree. The process is slow, but each new bud creates another little branch. As the process of budding and branching continues over time, there are more and more places for new tips to grow. Each bud is individual, but when you trace it back, each is anchored to the previous branch, and in the one before that, until you get all the way back to the trunk and root that generated and continues to support all of them. We are fortunate that Needham, for the most part, has been a tree. So, let’s look at Palmer’s first century. Palmer’s account of the town was a narrow one to our eyes, bounded almost exclusively by the church and its ministers. This surprises us today, but in 1811 the unity of church and state had not yet been dissolved. The town was founded on this unity. First Church was also Only Church. In 1711, when Needham sought separation from Dedham, the legal definition of a town was a church, a school so children would be taught to read the Bible, and taxation to support a minister. The Meeting House, the town’s only public building, was the center of both spiritual and political authority. Every couple of weeks, after service was over, the minister would step down from the pulpit and the Moderator would take over, and town meeting was held. Religious and civic affairs were intertwined. When the farmers petitioned the General Court for separation from Dedham, their main argument was the difficulty of getting to church, especially in the winter when the Charles River flooded the roads, and thereby losing both spiritual consolation and their voice in town meeting. 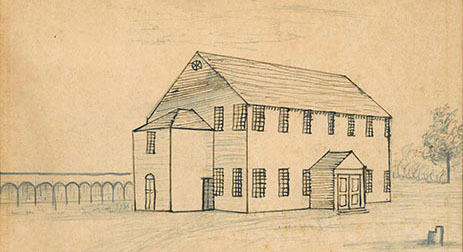 The first Meeting House as it looked in 1720. Sketch by Timothy Newell Smith, 1861. In that first one hundred years of its history, Needham was a stable community – one church and only three ministers, Palmer included. Despite that stability, Needham did have its problems. There were ongoing complaints from the western part of town (that’s Wellesley) over the location of the church. Less settled and more of a wilderness, the westerners were having trouble reaching church because of the poor conditions of the roads. Then one night in February 1774, the meeting house burned down. It was widely suspected that men from the west had perpetrated this crime in an effort to have the building moved closer to them. In fact, on the day that the community came together to rebuild, a delegation of west Needham men marched to the center to make such a demand. The easterners, anticipating them, had gotten up at dawn and had already built the frame, so the church stayed on Nehoiden Street. 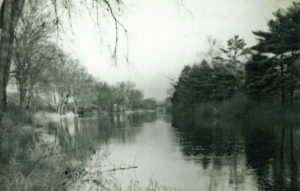 Flooding on “The Causeway” (Great Plain Avenue leading into Dedham), 1938. Outside of the church, the defining event of the 18th century in Needham was the Revolutionary War. Although a few Needham men had fought in the French and Indian War, the Revolution involved everyone. When the alarm came on April 19, 1775, 185 men – every able bodied man in town except the minister – marched to Lexington. They met the British at Jason Russell’s Farm in Arlington, where five were killed. Looking into Needham’s second century, we see our tree forming its first branches. The first half of the century was uneventful. The town enjoyed a modest prosperity based on farming, especially dairy farming. The population had grown from 250 people in 1711 to 1,100 in 1810. They were, for the most part, healthy; Palmer noted that 15% of the population – one in seven – lived to exceed 70 years of age and a few even lived to see 90 or more. But trouble was brewing in West Needham again. Although they did finally get their own parish, the disagreements still festered. In the 1830s West Needham got a train – a line from Boston to Worcester. It was a desirable route, and soon businessmen, men of means, begin moving into the western part of town. The two halves of the town began to develop different characters. The tree really begins to branch out in the 1830s, and the impetus is an event that only a few of us here have even heard of – the disestablishment of the church and the trinitarian split. 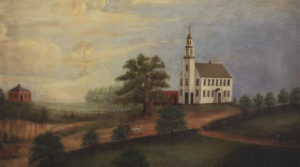 Despite the provisions of the federal constitution, taxpayers in Massachusetts were still obliged, just as in 1711, to pay taxes in support of the established parish – First Parish – whether or not they were members. At the same time, tensions within the church were growing between the Unitarians (who did not believe in the separate divinity of Christ) and the trinitarians, who did. Dissenters wanted to support their own congregations, and not pay their taxes to support a church they did not pray in. Relief from this tax was a major issue in its day, involving legislative battles and in Dedham, even riots. The event is important in Needham as well, but is less of a trauma, because by 1850 our tree has become truly a family tree. A small village, the families that lived here stayed here, and over time marriage between them resulted in a town that was made up almost entirely of cousins. 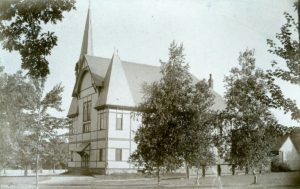 The First Baptist Church, in its original location on the corner of Highland Avenue and Great Plain Avenue. In 1928, it was moved to its current location at the corner of Warren Street. Finally freed from taxes to the First Parish, trinitarians and others were able to support parishes more congenial to their beliefs, and for the first time Needham had multiple churches. 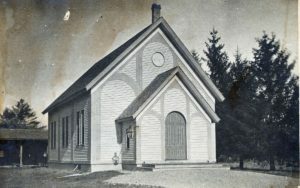 The first services of the Baptist Church in Needham were held in 1854. No one rioted in Needham when this happened. In fact, when the Baptists began collecting subscriptions to build a church, several of the donors were not even Baptists. It’s a pattern we will see again, and says something quite remarkable about our community. The Evangelical Congregational church adopted its covenant in 1857, led by Needham physician Josiah Noyes. Dr Noyes and his wife Elizabeth are the first two names on the document. Noyes was a physician in town for about 50 years – Needham’s first to have medical training – as well as a natural scientist in the broad sense – botanist, geographer, chemist, and linguist. He was a devout man, who taught himself Hebrew so he could read the Old Testament in the original. He led Needham and the congregation in its efforts for Abolition and Temperance; he formed the Needham Lyceum as a forum for public discussion of these issues and others. The Evangelical Congregational Chapel (built 1854), on Chapel Street. The First Congregational Chapel was built two years later, in 1859, on what is now Chapel Street. In those days, the street went from the corner of Great Plain, and made a sharp right turn through what is now the Town Hall staff parking lot. The Chapel was at the bend, what would now be in the middle of the road between the Bank drive-thru and Lola Tortolla. 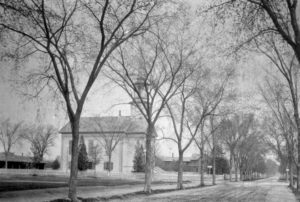 By 1886, the growing church purchased this land on Linden Street and built a new church. This beautiful structure was destroyed by fire in 1924, and a new brick church was built. This became the Parish Hall in the 1950s when the present church was built. I think the watershed event in Needham history is the coming of the train to East Needham in 1853. The line to Needham’s Great Plain changed everything. The train went to the relatively empty Great Plain because the First Parish did not want it crossing their land in the old center. The train took away gravel to fill Boston’s Back Bay, and brought in new residents and ideas. It also drew businesses and activity away from the old center as transportation on the railroad overtook travel on the coach roads. Over the next 25 years, the old center was abandoned, leaving nothing there of importance except the church. 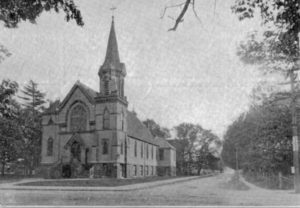 Then in 1878, even the church was moved, lifted onto rollers and carefully dragged to its current Dedham Avenue location. The Methodist Episcopal Church (later, the Carter Memorial United Methodist Church), on Highland Avenue, circa 1900. Our Needham tree started growing a strong second shoot around this same time, with the development of Needham Heights. Events in Great Britain, especially the upheaval caused by industrialization in the English Midlands and the potato famine in Ireland, brought the first serious influx of immigrants to Needham, most of whom settled in the Heights. Among these were the knitters, like William Carter, whose mills would be the mainstay of Needham’s industrial economy. These folks were not Unitarian, or even Congregational or Baptist. They were for the most part Methodists, and a few were Anglicans. The Irish were Roman Catholics. For the earlier immigrants, there were Catholic and Methodist parishes in Upper Falls; Catholics living in Needham Heights belonged to the parish of St Mary Immaculate. In fact, Needham Heights original name, Highlandville, reflected its strong orientation toward Newton. 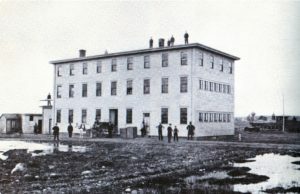 Building the Carter and Lee Knitting mill in 1864, on Highland Avenue. Proximity to the train track (note the locomotive in the background) helped Carter and the other mills to move their merchandise to market. In 1874, becoming wealthy in the textile trade, William Carter and the other large mill owners collected money to purchase land on Highland Avenue and build a Methodist church in Needham. When Needham’s tiny Episcopal parish of 20 people was determined to build its own church, Christ Church, they were assisted in the purchase by William Carter and the Methodist Church. And in 1890, St Joseph Parish was established as a mission church of Upper Falls and West Roxbury. And as with the building of the Baptist and Episcopal Churches, assistance to St Joseph’s came from unexpected places – their Congregational and Unitarian neighbors. St Joe’s first building was the old Congregational Chapel on Chapel Street, which housed them for two years until they could build a church of their own. The first church building on the corner of Highland Avenue and May Street, was built in 1891 on a lot owned by the Ladies of the First Parish. St. Joseph’s first church, on the corner of Highland Avenue and May Street. 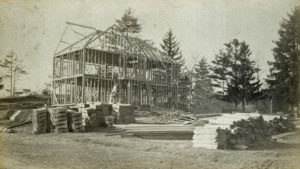 The Cornerstone of the new church was laid on September 20, 1891 by Archbishop Willams. The parish grew rapidly, and within 20 years became the largest congregation in Needham. Sadly, the church was completely destroyed by fire in February 1913. To help out, every congregation in town, and even some businesses, offered the church space to hold Mass on Sundays. The Selectmen offered the use of Town Hall, so after a few months that became the temporary chapel. The rebuilt church was unfortunately unstable and only lasted for two years before it had to be torn down. So in 1917, St Joe’s began its new life as a canonical parish with a new building, a sturdy Gothic stone structure that lasted until it was replaced by the current building in 1964. I would like to be able to say that all this cooperation and assistance shows that everyone was friends and their were no animosities or biases. But of course that is not true. But it does show that people of faith in Needham understood the importance of faith to others, even though they did not agree on practice or doctrine. By 1900, Needham had grown from one parish to seven. Needham’s tree suffered its most significant damage, even to the loss of part of its trunk, when West Needham voted in 1881 to establish itself as the town of Wellesley. This crack, which began in the 18th century over the burning of the church, had widened through the 19th century as affluent men, whose primary connections lay in Boston, began buying land in West Needham. The split left the town weakened, financially and emotionally, in the final decades of the 19th century. As Needham entered the 20th century it was changing fast, and it was not always comfortable with the changes. European political upheavals brought new immigrants from Italy, Poland and Russia. 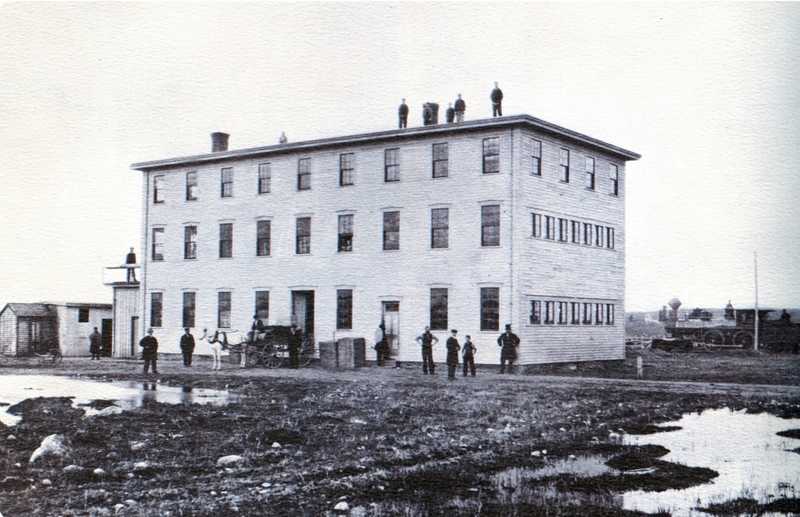 Most of these immigrants settled in the Heights to provide labor for the growing knitting mills, and Needham’s population rose to 5000. For the first time, neighborhoods were identified by ethnicity as well as location. And the identifications were often unfriendly. Italians lived in Guinea Alley, the area around Sachem Road. Poles and Russians lived in Poleville, which we now call Riverside. Needham’s growing Jewish population lived in the Gaza Strip – Hunting Road and Gould Street. Neighborhoods grew rapidly, and were maintained in part by ethnic and religious ties, and in part by an overt policy of restrictions in real estate sales. Ads for new homes in Needham often cheerfully assured interested buyers that “strong restrictions made for good neighbors”. A new house being built on Spruce Street, circa 1890. The Second World War changed all this. Going to war, Needham men and women got a crash course in regional and cultural diversity. They came home with broader perspective, and a tragic understanding of the price of racial and religious divisiveness. Post war prosperity also brought development and mobility. 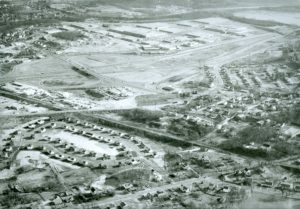 The 1950s saw the construction of Route 128, and with it the boom in business construction in the suburbs. Just as the old railroad brought Boston to Needham, 128 and the Industrial Center brought Needham the world. By 1960, Needham’s population reached 26,000 – a 100% increase since the start of World War II. 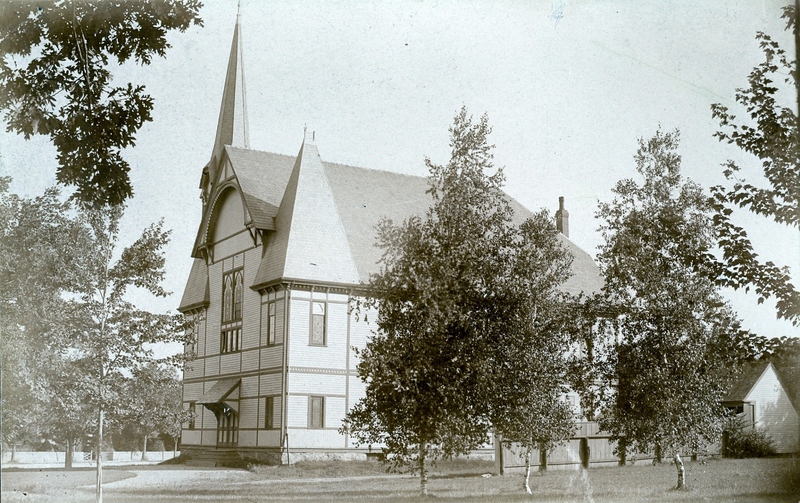 And as the houses sprang up, so did the congregations – several new congregations were established in Needham in the 1950s, including Grace Lutheran; the Presbyterian Church; a second catholic parish at St. Bartholomew’s; Temple Beth Shalom, Needham’s first Jewish congregation; and Temple Aliyah a few years later. 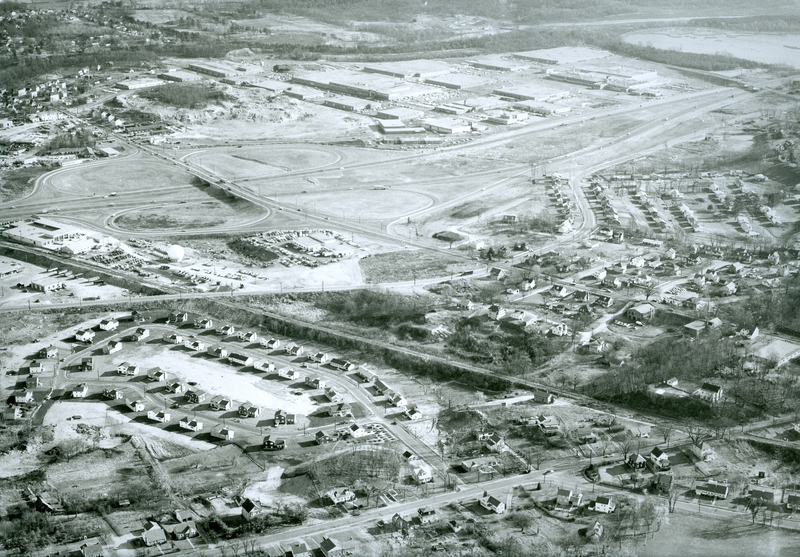 Building Route 128 (Exit 19) and the New England Industrial Center in 1950. Note the rapid growth of orderly new residential developments at the left (Evelyn Road) and right (Hunting Road) margins of the picture. By my count, there are now 22 distinct congregations in Needham, and I know I’ve probably missed a few. Where 300 years ago we sought uniformity to make us whole, we now embrace diversity as a way to expand both our personal and public horizons. We have even institutionalized it, and instead of the established church we have the Needham Clergy Association to represent our many houses of worship. And our community is still strengthened by generosity: during the two years when the First Parish was renovating its historic church, they found their temporary home at Temple Beth Shalom and the Temple also provided a home for the Carter Methodist Church during its recent renovations. And in 2016, when Beth Shalom expanded the temple, their services were held at First Parish. And when they dedicated the new temple, they did so with blessings from Needham’s assembled clergy. In closing his Century Sermon, the Rev. Stephen Palmer looked forward: “One hundred years from this day, perhaps the future inhabitants of this town, in imitation of our example, will meet together”. And we have – to celebrate our town’s bicentennial and its tercentennial, the 150th anniversaries of the Baptist and Congregational Parishes a few years ago, the centennial of St Joe’s and the 150th of Carter Methodist in 2017. More than two hundred years have gone by since Palmer’s sermon. In gathering together to celebrate, we too remember the days of old and consider the years of many generations, and we are grateful for the town they left us. But we also look forward to the next generations and the community that we leave to them – one rooted in our past achievements, but valuing diversity, and inclusive rather than exclusive. On the mighty tree of our history we are the growing tips, individual and different, but bound together by the branches and boughs, and held up by that strong trunk that started growing in 1711. We are, in our time, setting our own strong branches for the citizens of Needham’s future. The Greenwood Oak, Nehoiden Street. 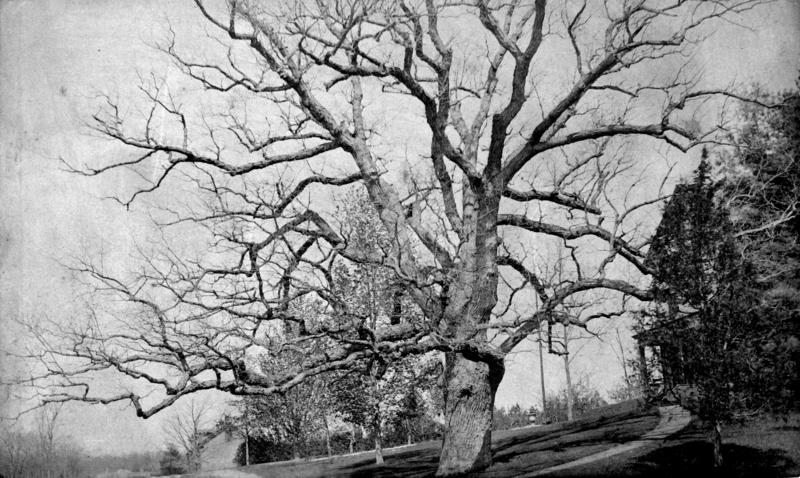 When the tree fell in 1908, it was estimated to be over 300 years old.